Well, 4th of July is upon us and not only is it the an incredible holiday to celebrate our country’s independence, but it is also a great opportunity to get together with relatives and friends. Since it pretty much falls in the middle of the summer it is also the ultimate grilling fest in so many ways. Whether you are camping, at the beach, or just celebrating in your backyard, grilling is just a part of summer get togethers. Sure we all love our traditional hot dogs, steaks, and even fish on the grill. But, have you ever thought of trying a veggie burger on the grill? 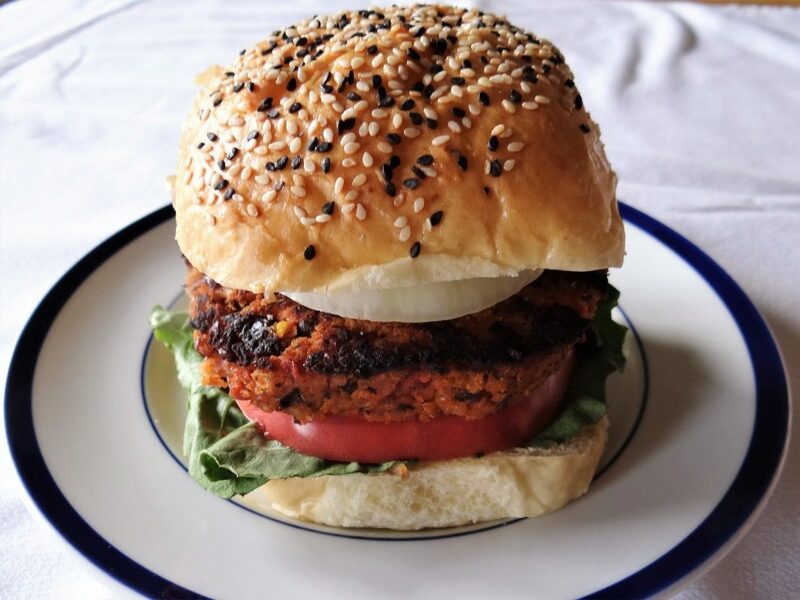 Well, I have just the recipe for you…my Barbecue Black Bean Burgers. This burger is super easy to make and oh so flavorful. As the hostess of a party, one thing I try and do when having big gatherings is to be mindful of those who may be vegetarian or watching their meat intake. This recipe for Barbecue Black Bean Burgers is a perfect solution especially when you are having a cookout. The recipe starts with black beans, of course, and chickpeas. Then I add some bread crumbs and brown rice to help bind the ingredients together. 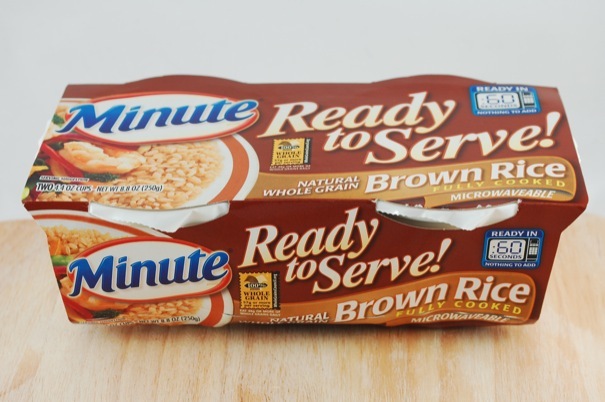 Minute Rice makes perfect little brown rice cups that cook in literally 1 minute. The rice really balances out the beans with its lighter texture. Next I add spices and some other ingredients like mustard, barbecue sauce and egg, along with a little onion and carrots for crunch and sweetness. You do have the option of making the burger completely vegetarian by eliminating the egg and substituting vegan mayonnaise in the recipe. The final ingredient I put in my burgers is a little unusual. 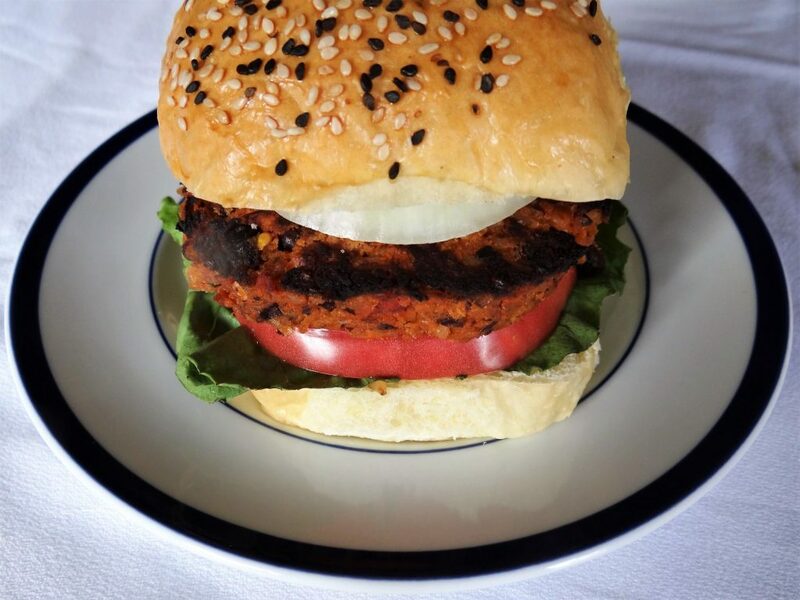 It adds a little tang and a lot of flavor to the Barbecue Black Bean Burger though. Are you ready for it??? Pickled Beets. Yes, I did say pickled beets. Even if you do not like beets, you can’t even tell they are in the burger. The cool thing too is that they add a little tinge of pink to make the burger look like real meat. Fun, huh? Finally when you top the burger with all the usual add-on’s like lettuce, tomato, onion and all your favorite condiments, you will make a burger that looks like the real deal! Now, one of the secrets to grilling veggie burgers like my Barbecue Black Bean Burger is to form them into nice, thick patties and then freeze them. The pursose of doing this is two-fold. By freezing them, you give the burger lots of form so when you put it on a hot grill, it will cook perfectly and not fall apart. Second, if you do not plan to use the burgers in one setting, they are already frozen for you to use at a later date. 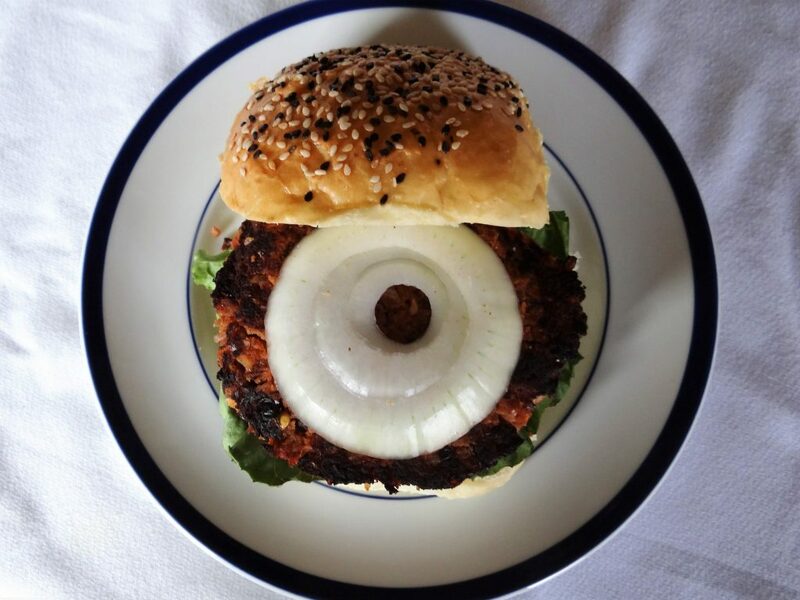 So, enjoy this new creation of Barbecue Black Bean Burgers. Who knows, it may even make you a lover of veggie burgers. Like my mom always said, “All you need to do is try it once and then you can decide if you like it or not.” At least you tried it! But, I think this one will become a new favorite. So, Happy Grilling and Happy 4th of July Weekend…From the Memorable Kitchen! Process black beans and garbanzo beans in a food processor or blender for about 30 seconds to form tiny pea size bits. Place in a medium sized bowl. Add in cooked brown rice. Process beets and carrots for about 20 seconds until smooth. Place over beans. Mix in remaining ingredients, except buns and condiments and mix with a spoon until completely combined. The mixture needs to be wet but if it seems too wet add a tablespoon or more of bread crumbs. Form mixture into 4 patties that are about ½ inch thick. Place patties on a wax paper or parchment paper lined baking sheet. Cover with another piece of paper and freeze for at least one hour. Take olive oil and brush on a grill or large frying pan. Grill or fry the patties over medium high heat 2-3 minutes on each side. Place on hamburger buns and serve with vegetables and condiments. If you do not use all 4 burgers, wrap remaining in plastic wrap and place in a freezer ziploc bag. Place in freezer until ready to use.